CHARLOTTE – Tarheel Linen Service, Inc. is celebrating the New Year in a new location, conveniently located to serve their customers in the restaurants, hospitality and healthcare industries with more precision and effectiveness. 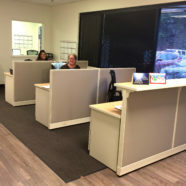 Spurred by demand for a quality driven, responsive service company in the local market, the company recently completed a move into a new facility offering more space and access to upgraded technology to enhance its personalized service to the market. Based out of Charlotte, Tarheel Linen Service is a family-owned, independently operated company which delivers linen, mats, uniforms and hygiene products to businesses throughout North and South Carolina.